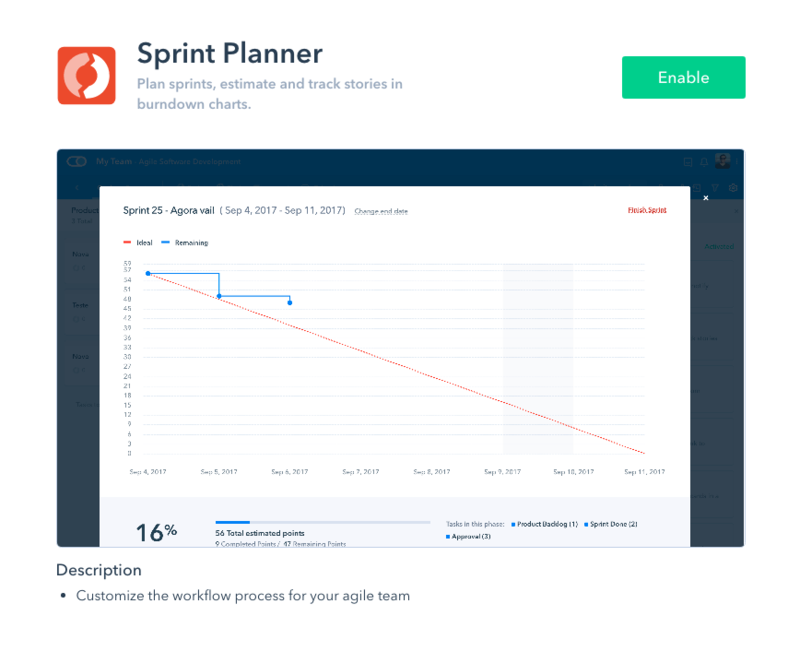 Pipefy's sprint planner was especially developed to help you manage your Scrum sprints within our platform. 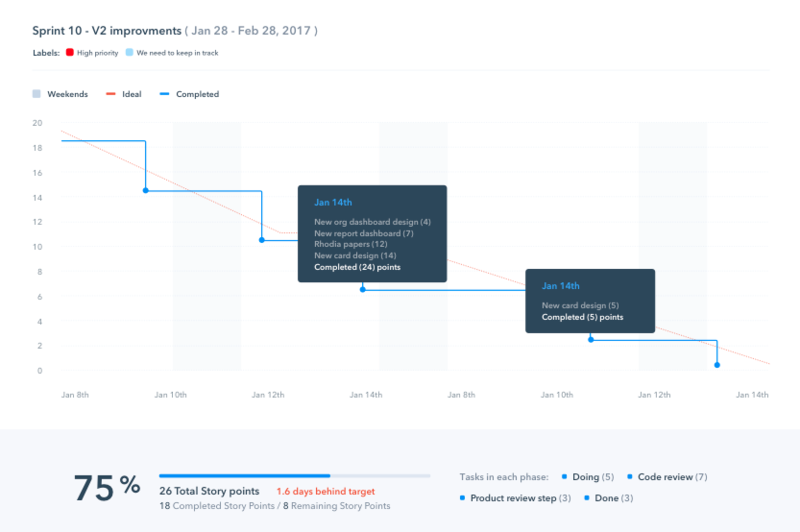 By enabling this pipe app you will no longer need to use external applications to plan your sprints, estimate the effort and track your stories in burndown charts. How to enable the sprint planner app? Estimate the effort: choose whether you want to select a specific field from your pipe to estimate the effort/story points per task (click here to learn more about agile estimation techniques) or don't use an estimate and simply count the story points by the amount of cards (all cards will have the same effort estimation). If you decide to choose a field from your pipe as the source for the story points, you'll need to create a number field where you'll manually input the number of story points for each card. As you add the cards, you'll see the story points total in the bottom left corner of the tab. 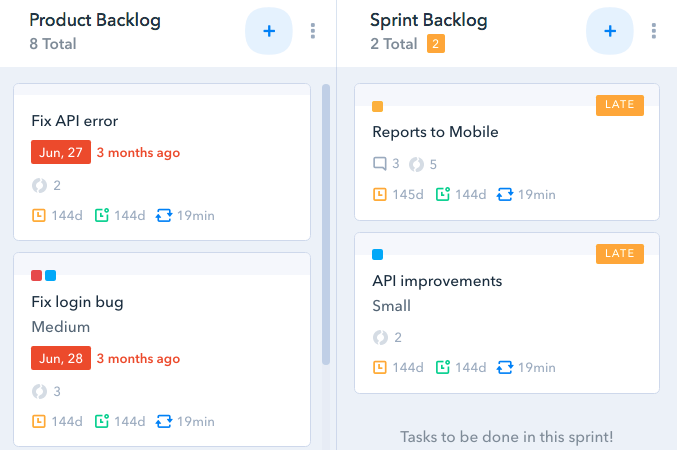 You can drag and drop cards to determine which tasks/stories are of highest priority in this sprint. 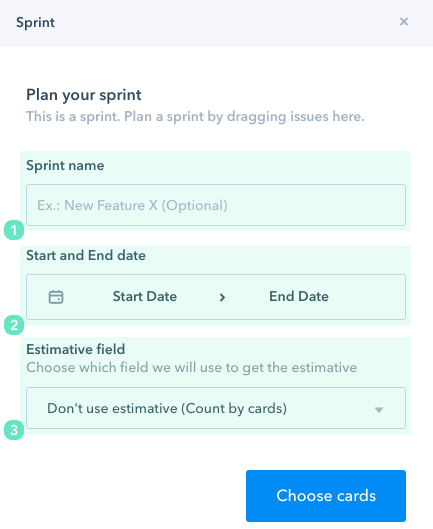 After you're done adding and reordering cards, click on 'Start Sprint' to begin tracking the sprint. 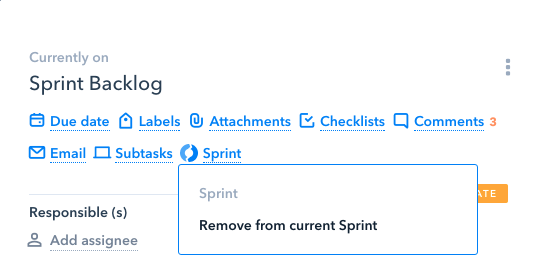 More options: Change the sprint's end date or go back to view past sprints. 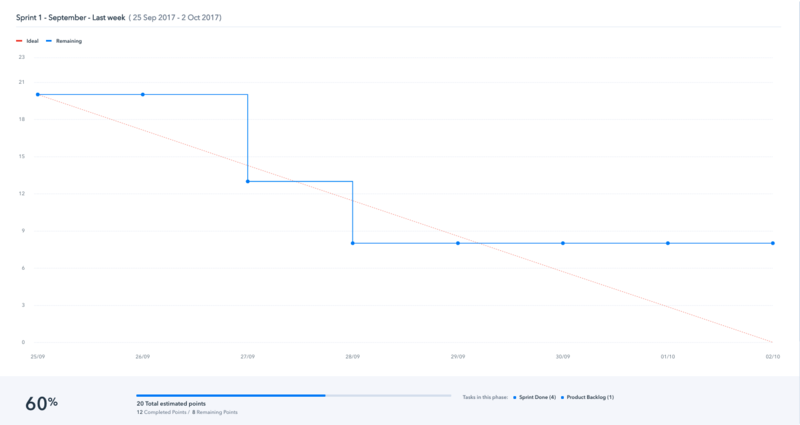 The burndown chart will always show two lines: a red one that establishes the ideal work rhythm and a blue one that shows the stories/tasks that have already been completed. Once you click on it you'll see a dropdown menu of your pipe's phases. Once you choose a phase (sprint done, for example) the story (parent card) is moved to the selected phase. 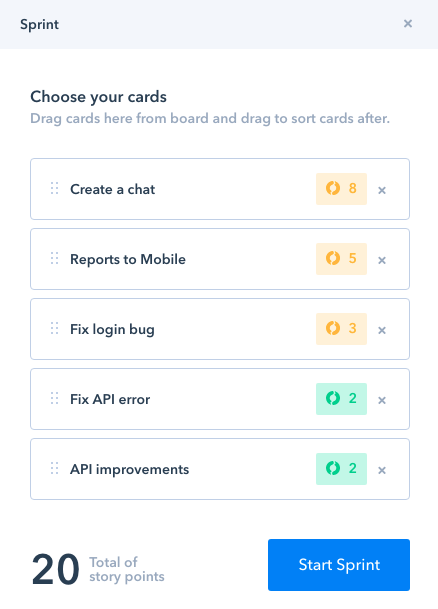 If the story doesn't have any tasks, simply click on "view story" to open the card and move the card to another phase using the action buttons. How to finish a sprint? All sprints have to be manually finished. They don't close automatically when they reach the established 'end date'. 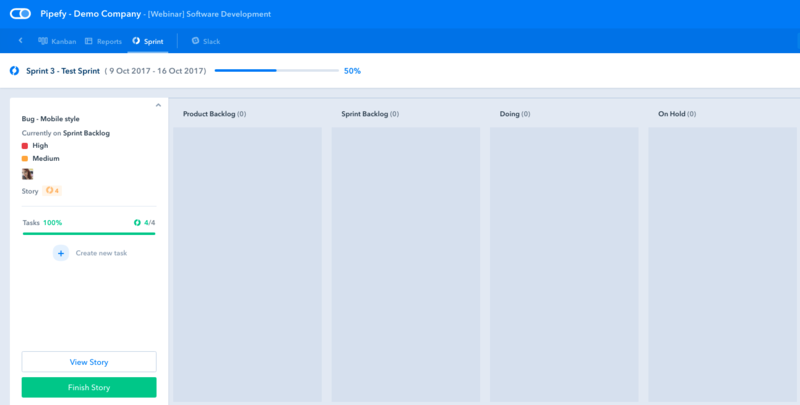 You can finish a sprint by clicking on 'finish sprint' in the upper right corner of the sprint's chart window. Once a sprint is finished it can't be reopened. How to add or remove a card from a sprint (after it's begun)? You can add or remove card's to a sprint after you've initiated it. 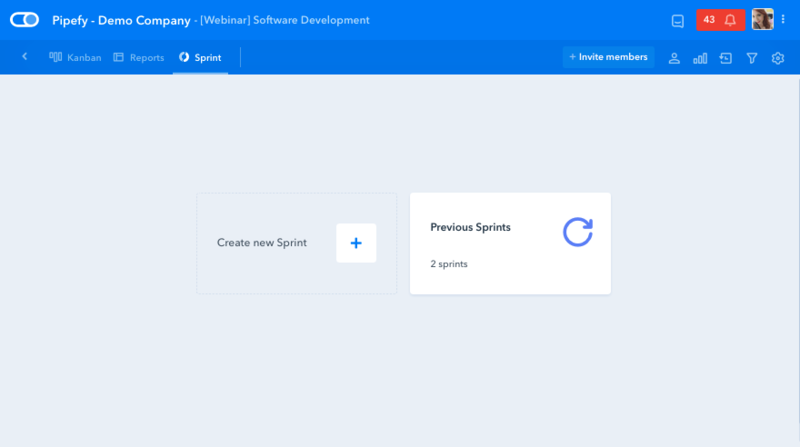 To add a new card to the current sprint, open the card, click on the Sprint icon then click on 'Add to current Sprint'. 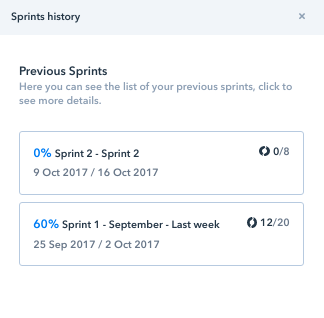 How to view previous sprints? 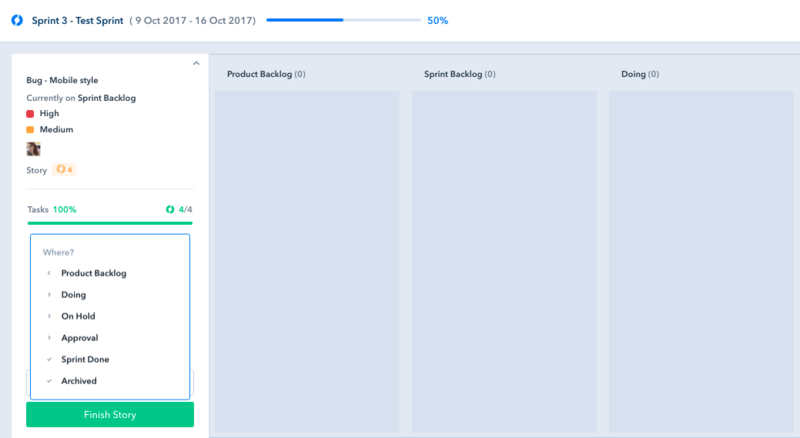 The past sprints view will show you the exact information about each card's status at the moment the sprint was finished. 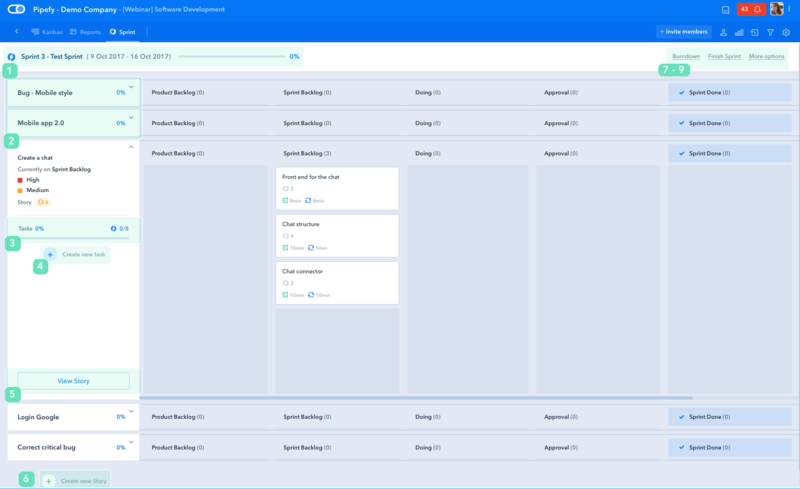 The information is static, which means that if the cards are updated after the sprint is finished, the information in the 'previous sprints' view will remain the same.